Cut each potato lengthwise in half. Cut each potato piece in half lengthwise, again. Then, cut each piece into 2-3 uniform-sized wedges. Each potato should make about 10-12 wedges. Repeat for remaining pieces/potatoes. Place wedges into a bowl of cold water for 20 minutes. Preheat oven to 475. Spray a large, rimmed baking pan with cooking spray. Make sure the pan is large enough so that the potatoes will lie in one layer. Drain potato wedges and rinse them in 2-3 more washes of water, until the water runs clear. Place them on paper towels and dry them thoroughly. 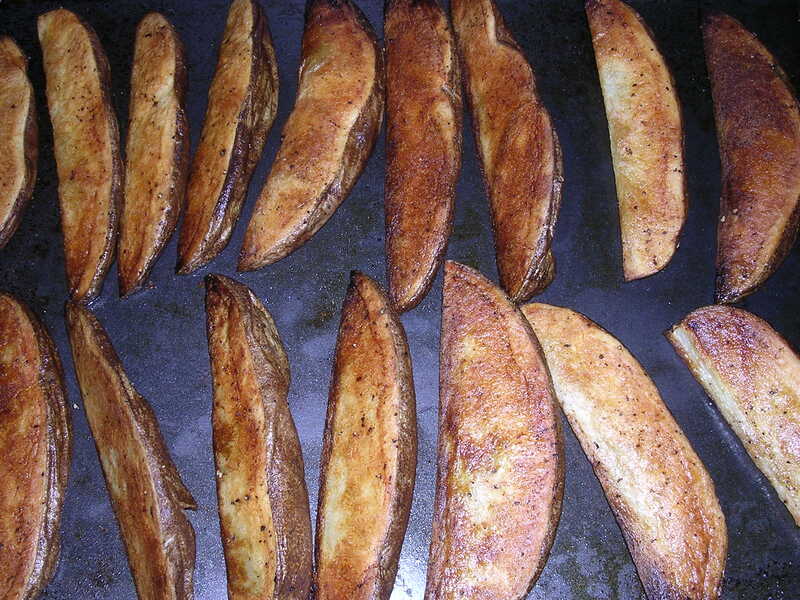 In the large baking pan, toss the wedges with olive oil, salt and pepper to coat. Arrange each wedge lying on its side in the pan in a single layer. Cover pan tightly with aluminum foil. Place in oven and bake for 5 minutes. Take aluminum foil off and bake for an additional 15 minutes. Take potatoes out and using tongs, flip each wedge. Bake for another 10-15 minutes, until potatoes are golden and crisp. Drain potatoes on a plate covered in paper towels. Season with salt and pepper, if desired. Serve warm with ketchup or bbq sauce.